Are you giving your office a makeover or just searching to replace an irreparable scratched and coffee-stained computer desk at a former employee’s workstation? 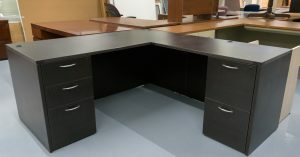 Nolt’s Office Furniture has a wide selection of previously owned office desks of all shapes and sizes. If you need something simple for a temp or an executive desk with plenty of drawers and shelves, our furniture experts can point you in the right direction. Two showroom floors boast only the best quality office furniture for all needs, and our constantly rotating stock ensures you’ll have a new experience with every visit. What type of desk are you looking for? When you’re outgrowing your office space, we can help you furnish your new location with various types of preowned office desks. First impressions are everlasting, so an elegant reception desk is a must. Its size should suit your reception area as well as the needs of your receptionist(s). It should also contain plenty of storage space for filing and essentials like packs of staples, printer paper, and extra notepads. L-shaped desks make for comfortable and spacious workstations for employees with a lot on their plates (and desks). You’ll find an array of wood stains at our showroom; our expanding and rotating stock always has something for every office environment. Executive desks are perfect for the C-level executives in your office, and our stock of preowned office desks will not disappoint. At Nolt’s Office Furniture, we understand that executive desks need to have a large enough surface to hold everything from picture-perfect family photos to classy paperweights and all other sorts of must-have desk accessories and organizers. Do you need an office desk for a smaller space? If you’re looking to furnish your home office, we have previously owned office desks to suit any size space. Come visit our showroom in Ephrata, PA to pick the perfect piece for your place. When you order from us, our experts will gladly work with you in your office to determine the most practical spot for your purchase before it’s delivered. Be sure to check out our delivery commitment to you!